Learn to play uke! Ukalalien: n. a newly converted ukulele player prone to singing & strumming while engaging in spontaneous acts of music & singing, alone & with others, regardless of setting or circumstances, creating a euphoric sense of well being. The Ukalaliens Songbook & Companion CD is for absolute beginners! Learn to play the ukulele and sing with 20 folk songs all by yourself or with a group of friends. It's easy and fun. This book & CD set is filled with all original colorful, whimsical drawings by Steve Einhorn. Lifelong folk musicians, Kate & Steve created a method that works for just about everybody and make it irresistably fun to learn to play and sing with the ukulele. Sporting the revolutionary "Flip - Flaps", this easy-to-use book and CD teaches non-musicians and the uninitiated the joys of playing and singing with the ukulele. Chords and tuning apply to all soprano, concert & tenor ukuleles. "It's not just a book & CD, the Ukalaliens Songbook is a movement!" THE UKALALIENS, a folk duo including Kate Power and Steve Einhorn, have been conducting retail clinics coast-to-coast sponsored by Kala brand ukuleles. Authors of the book "The Ukalaliens Songbook, A Beginner's Guide to Ukulele Fun", Kate and Steve have shared the stage with folk luminaries such as Pete Seeger and have performed on Garrison Keillor's A Prairie Home Companion. - The book & CD is the next best thing to being there! Folk troubadours, Kate Power and Steve Einhorn, have created a magical introduction to the wonderful world of ukulele playing with their book and CD project, the Ukalaiens Songbook: A Beginner’s Guide to Ukulele Fun...and that’s just what this delightful little book and CD are, fun! From the whimsical original illustrations by Steve to the diverse collection of simple folk tunes the book will immediately have the aspiring ukuleleist strumming and singing right from the get-go. For the more adventurous players the book also includes a number of beginning finger-picking patterns and left hand techniques. Another feature unique to the book is handy “flip-flap chord charts" that pop up from the book to demonstrate how to play the tunes in a variety of keys. Steve’s pleasant voice guides you patiently through uke basics and the 20 tunes contained on the CD, which include folk classics Careless Love, Crawdad Hole and Shady Grove, in addition to, the lovely original tunes Annabelle, Under the Moon and Pretty Little Girl. As an added bonus, the CD contains the glorious harmony singing of Kate and Steve which have made them Northwest folk icons. with others. Their relaxed, no hurry, presentation is the perfect welcome to beginning musicians of all ages. 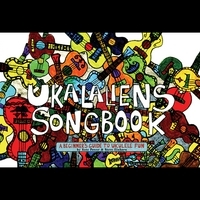 I would recommend the Ukalaliens Songbook to anyone wishing a thoroughly enjoyable musical introduction to playing the sweetest of stringed instruments, the ukulele.